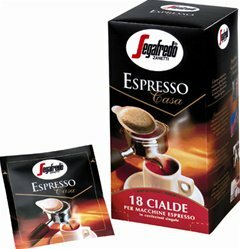 Segafredo now offer a selection of blends in easy to use and convenient ESE coffee pods. The unmistakable fragrance and taste of Segafredo Zanetti blends captured in a coffee pod, a balanced blend of the highest Arabica and Robusta qualities, creamy and with an intense fragrance. Just like an espresso at the bar. Coffee characteristics: dark roast, good crema, higher caffeine content, for espresso machines. The coffee pods are designed to be compatible with the ESE coffee system, and are manufactured individually in order to keep their fragrance intact. Segafredo Zanetti was founded in 1973 by Massimo Zanetti in Rastignano, which is located in the Bologna. The company originally distributed coffee solely in Italy, but after becoming the market leader in Italy, Segafredo chose to expand their distribution internationally, with a focus on increasing retail sales and servicing coffee shops. Today the Segafredo Zanetti group grows, selects, sells and distributes green coffee, whilst concurrently producing more than 1.5 million bags of roasted coffee a year.